For over two thousand years, many artists have been inspired by The Last Supper, Christ’s last meal during which the son of God delivered his testament. There are thirteen people at the table, as if in a perfectly staged play. With ” …Do Not Take It, Do Not Eat It, This Is Not My Body… “ , the Cameroon artist is showing us some sort of anti-Last Supper. A secular proposal in which God, in his Judeo-Christian conception, is absent. The event, it is best to that expression than the word “show”, which doesn’t correspond to the theme at all, takes place in two stages. We could describe it as a diptych. On the one hand, it is a purely formal element: a bead curtain which, borrowing from the Leonard de Vinci painting, represents a sketch, an abstract projection, presenting us with an empty table. Christ and his apostles appear to have deserted their places and we are left to wonder if it is not primarily a temporal experience that we are facing. The table is empty as if it is enough in itself. As if it doesn’t matter if the meal took place before or after. It is up to us to fill the haunted void. This void, which we know represents the very essence of all spirituality: the omnipresence of absence. Absence as an impossible idealisation, absence as a grip that is lost forever and which will remain nothing but a memory. A naturally truncated memory since only our despairing determination convinces us that there is something to see. Absence as the symbol of a new epiphany. This tableau’s counterpart is a lively and carnal scene (the word is used deliberately). A moment of physical presence, which the spectator is invited to look at. In this lively tableau, it is the meal, and not its abstraction, which marks the curtain’s counterpoint. The curtain, in its primary function, is reduced to a decorative element. A decorative element overdetermining that the performance will try to contradict by playing, not on the reference but on its contestation. The human becomes the centre of any possible realisation, and the display as a whole represents this part of the painting, which is so dear to the artist. Again, the meal itself is not the goal. Everything lies in the process. The long road leading to the final supper. There may be no supper. As in the curtain, we could have been invited to imagine the time before and the time afterwards. However, since the performance is the aesthetic and conceptual contradiction of the curtain, the spectator has the privilege of seeing that which cannot normally be seen, and will later say, as Rimbaud did, that they have seen, some times, that which man believes he has seen. This carnal moment, this moment of life, in the very sense of the term, undoubtedly holds the key to the riddle presented by the title of this moment. It depicts the age-old battle between God and humans. This ontological experience, which combines the secular and the sacred whilst humanising concepts that have been lost, by dint of its meaning being mechanically repeated, reminds us that sharing, in its simplicity and spontaneity, is what makes humanity. A reminder which is greatly appreciated in these troubled times. Drawing on contemporary art practice, this two-day international conference explores the relationship between historical research and artists’ methods and processes when working with recorded images found in archives. Contributors address current debates around the validity of research generated through artistic strategies, how these processes complicate forms of historical narration, as well as how they inform and challenge conventional methods of historical research. Contributors include: Sven Augustijnen, Frédérique Berthet, Adam Broomberg, Filipa César, Oliver Chanarin, TJ Demos, Mary Ann Doane, Nanina Guyer, Mark Nash, Colin MacCabe, Naeem Mohaiemen, Laura Mulvey, Michael Renov, Zineb Sedira, Louise Sheedy, Patrik Sjöberg and Chou Yu-Ling. Non-Euroamerican culture is a significant and firmly acknowledged part of the art scene and as such it is represented in galleries in the centres of the art world. The relationship, and sometimes tension, between art from countries located distant from Euroamerican capitals and local art work can be interpreted as one of the sources of debate in the art scene. This debate also provides an alternative approach to art practice as well as the possiblity of critical positions which would not be otherwise possible. The OneArt project as such will be the first institution which creates a bridge for contemporary art from Asia, Africa and Latin America to enter the local cultural scene. OneArt will give exposure to artists through events such as debates, exhibitions, exhibition catalogues, workshops, an academic journal, a library/ archive attached to the gallery, and its residency programme. 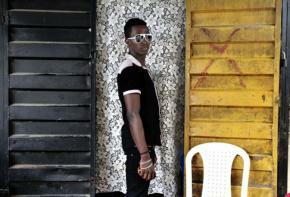 What is Contemporary Lusophone African Art? We start with a question that is simple in appearance but tellingly complex at the same time: What is contemporary Lusophone African art? Under question here are a number of key terms that need to be unpacked if we are to address this issue in a critical and challenging way: ‘contemporary’, ‘Lusophone’, ‘African’ and ‘art’. Each term is contested territory in its own right but in bringing them together within an interrogative form we are striving to open up a discursive platform in which these complex terms can be debated, critiqued and repositioned. 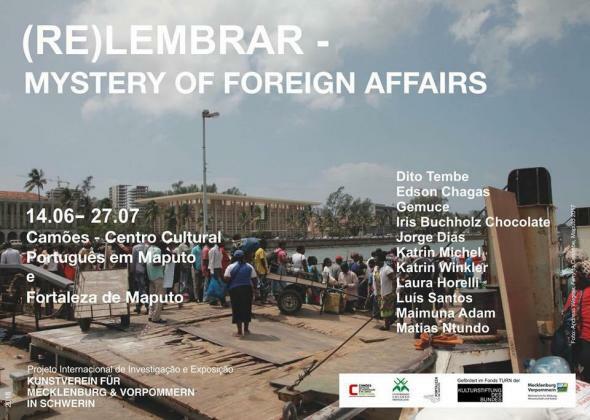 For example, so-called ‘Lusophone Africa’ is not a seamless whole. It includes a variety of countries each with very different social, political and cultural histories. In acknowledging this complexity, it is the hope of the editors that a significant gap in the geography of knowledge production of contemporary African art can begin to be addressed and in turn generate more research and debate across language and cultural borders. 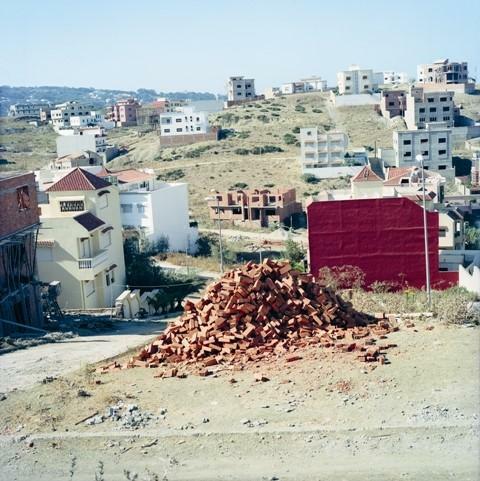 Yto Barrada the "Artist of the Year"
Riffs is the first large-scale exhibition in Germany of the work of Yto Barrada, whose photographs, films, publications, installations and sculptures engage with the peculiar situation of her hometown of Tangier, Morocco. With Yto Barrada, Deutsche Bank has elected a woman as “Artist of the Year” 2011 whose work has been closely involved with the political and social realities in North Africa for over a decade. In her first series A Life Full of Holes: The Strait Project, ten years ago, Barrada evokes a Tangier where postcolonial history has materialized one of its dead-ends. Her recent project Iris Tingitanaextends this inquiry to the fast-growing outer edges of the city, where the monocultural vision of planners and developers threaten to homogenize landscape and human lives. The show, featuring selected works from these past series as well as new photos and films is conceived as a construction in 3-dimensional space and a deliberate juxtaposition of works. It plays on the varying distances between Barrada’s lens as a photographer and her subjects, and displays the full range media in which she works. The show’s title is inspired by music, where “Riff” stands for a rhythmic figure, a musical phrase that some players add to a written score. Riff relates also to the rugged Rif mountains of Morocco, home to insurgencies and a splinter Republic, and to the art deco Rif Cinema, which houses the Tangier Cinémathèque. The three films, Beau Geste, Playground and Hand-Me- Downs, are also “riffing”—rearticulating spaces, sounds, and meanings. One of the recurring figures of the show is that of the tree—physical trees and family trees. Trees serve as metaphors of resistance and strength, of developing levels of vision, of generational transmission, of changing times, of shelter, regeneration and nutrition, but also of decor and tourism. Memory and obliviousness, history and unreliable narratives, as the details and fragmentation of every day life, are strongly involved in this show, and these themes are refracted between the pieces. The visitor, also, changes perspectives and levels—by mounting a mezzanine; moving from intimate projection spaces to a balcony that overlooks large walls of photos; sitting down in a screening room to watch the cinema program, presented by the Cinémathèque. Yto Barrada grew up between Tangier and Paris, where she studied history and political science at the Sorbonne, and subsequently attended the International Center of Photography in New York. Her practice, combining the strategies of documentary with a more meditative approach to images, drove her to return home after sixteen years abroad. Now based in Tangier, she continues to engage the complex realities around her, avoiding the rigidity of any ideological discourse, and without recourse to the spectacular or melodramatic. Another of Barrada’s responses to the dynamics of the region was to co-found the Cinémathèque de Tanger, North Africa’s first cinema cultural center, which she now directs. The Cinémathèque’s film programs, workshops, archive, and traveling presentations are another investment in the unique status of images and representations in the contemporary Arab world and beyond. Continuar a ler "Yto Barrada the "Artist of the Year""
Fondazione di Venezia is pleased to announce the new upcoming residency of the project Art Enclosures. Confini d’arte – Residencies for visiting international artists in Venice and would like to bring to your attention the general terms and deadlines of the residency programme, which will take place in Venice from June, July and September 2011 (with a break in August). The application deadline is 30 March 2011. The project: The project consists in a three-month residency period offering a series of activities and an opportunity for visibility to two emerging artists up to the age of 40 from the African continent. The programme makes available to the artists spaces to work and part of the materials necessary to create a works of art to be completed by the end of the 3-month period. The materials will be made available according to the artist’s requests. The visiting artists will also have the opportunity to be involved in the studio activities organized for them and thus come into contact with other local and international artists and the cultural activities run by Fondazione di Venezia and its institutional partners. During the residency period, a number of meetings will be organized locally to introduce and showcase the figure of the artist and his/her work in the most appropriates places, in particular university centers, art institutions and galleries. Finally, the artists will be offered the possibility to visit on a complimentary basis some of the main exhibitions and museums in the area. At the end of the three months’ residency, a small exhibition of the works produced will be held with the specific support of the artists themselves. A catalogue about the project will be published at the end of all residencies project. - a proposal (max. 600 characters) of the project/artwork that might be implemented/created during the residency period (English or French).